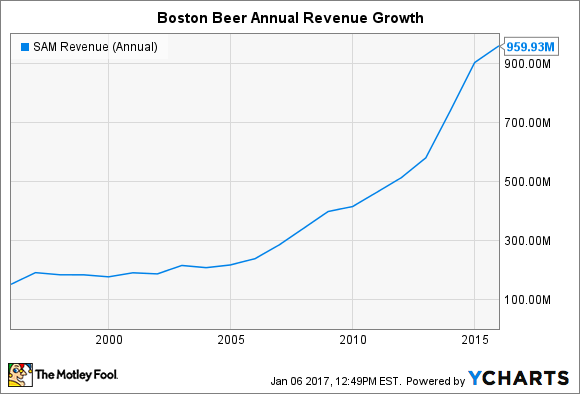 Sales Set to Slip at Boston Beer for the First Time in 13 Years: Should Investors Worry? The craft-beer leader has faced similar problems in the past, but this time it's different. When Boston Beer (NYSE:SAM) reports its end-of-year financial results next month, the craft brewer is poised to do something it hasn't done since 2003: record lower year-over-year revenue. It's a worrisome development, because unlike the last time this happened, craft-beer industry growth is slowing, so the brewer can't count on any broad momentum to help it out of this slump. Back in 2003, Boston Beer's distributors were still right-sizing their inventory of Samuel Adams Light beer that had just been introduced the year before. As a result, shipments were down 4% and depletions, or distributor sales to retailers, generally seen in the industry as a reliable proxy for consumer demand, were flat for the year. Fast-forward 13 years later, and because Boston Beer is a much larger, more diverse company, the problems are magnified as well. Not only is the brewer seeing depletion volumes declining because of weakness with its flagship Samuel Adams brand just as before, but now its Angry Orchard and Coney Island brands of hard cider and soda are ailing, too. In the third quarter, depletions fell 8% and were down 6% year to date, suggesting the downdraft is accelerating. Sales for the first three quarters totaled $734.5 million, three times more than what it reported for all of 2003, but they're also 7.5% below what it posted in 2015 during the same period. That doesn't bode well for the fourth quarter, where it forecasts that shipments and depletions will finish the year down anywhere from 2% to 6%. What makes it worse is Boston Beer includes in its projections price increases of between 1% and 2% plus an extra selling week, as 2016 has 53 weeks, compared with 52 weeks last year. So even with higher prices and more selling days, Boston Beer is still coming up short. The slowing craft-beer industry has, of course, been extensively covered, a victim of its own success. There are now some 5,000 craft brewers producing beer, making it increasingly difficult to grab shelf or tap space. Of course, Boston Beer, as one of the industry's largest, has more clout than most when it brings a new product to market. That has worked in its favor in the past, but its size may be working against it now. The trends in craft beer seem to favor unique, local beers, and millennials are exhibiting little of the brand loyalty older beer drinkers did. They're always off looking for the latest new taste in the market. And because of Samuel Adams' longevity -- it's been around for over three decades -- the beer is likened to drinking the same beer your dad did, which could be death for a brew among younger drinkers. Not all craft beers are reeling. Craft Brew Alliance (NASDAQ:BREW) has seen shipments of its Kona brand surge 17% over the first three quarters of 2016, while distributor Constellation Brands (NYSE:STZ), which owns Mexican beer brands Corona and Modelo, plus craft beer Ballast Point -- which it acquired in November 2015 for $1 billion -- saw the latter enjoy double-digit depletion growth in the third quarter. It contends that Ballast Point continues to be "the fastest growing major craft brand in the U.S."
Because Anheuser-Busch InBev (NYSE:BUD) has a significant investment in Craft Brew Alliance and Ballast Point is owned by Constellation, the Brewers Association industry trade group doesn't consider these beers to be true craft brews, though beer drinkers themselves probably don't make such distinctions. Yet even it has noted how it's the biggest craft brewers in the industry that are seeing growth slow, while the smallest names are still recording substantial growth. While that indicates that the craft-beer industry itself remains healthy, it is a problem for Boston Beer, which needs to find a way to reconnect with beer drinkers. Founder and CEO Jim Koch has a passion for the industry and in helping new brewers get their beers before drinkers, but such altruism is working against his company. In 2013, Boston Beer sold 1.2 million barrels of beer; it sold nearly that amount in the third quarter of 2016 alone. The leading craft brewer is still a financially sound company going through a particularly rough period, as it has several times since it went public. But the current difficulties show no sign of ending, and investors ought to be worried that there's no real plan to fix the underlying problem.